In the previous part Sports GPS-tracker: start testing I’ve described the test “spherical GPS in vacuum ” with the results of track by fixed sport GPS tracker application. These results were quite unsatisfactory. Remind that fixed device registered a fictitious “mileage” from 2.8 km (Strava and Sports Tracker) to 1.3 km (Runtastic) and drew fantastic tracks. The figures are indicative, but the principal investigator will treat them with reasonable distrust: the ideal-abstract test, of course is interesting, but better to estimate the accuracy of various sports applications in the real world. So I repeated the test in field conditions which are close to the battle. 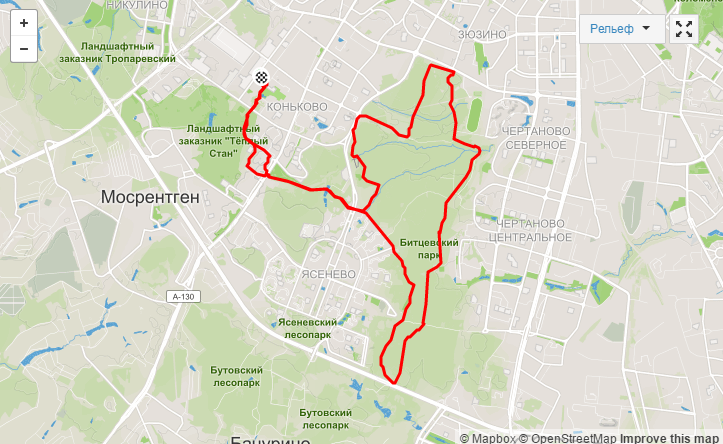 – long jogging in the woods with the terrain and the dense foliage “long run“. The test was conducted in the real interval training in the stadium 10 * 400 / 400 that is 20 laps or 8 km in the mode of “circle fast, circle slow”. Errors more than ten percent! twenty percent !!. Two circles !!! For information: by the rules permissible accuracy of measuring distances on the track is one thousandth , 0.1%. In other words, smartphones with a GPS-trackers lie in the a hundred times stronger than acceptable. 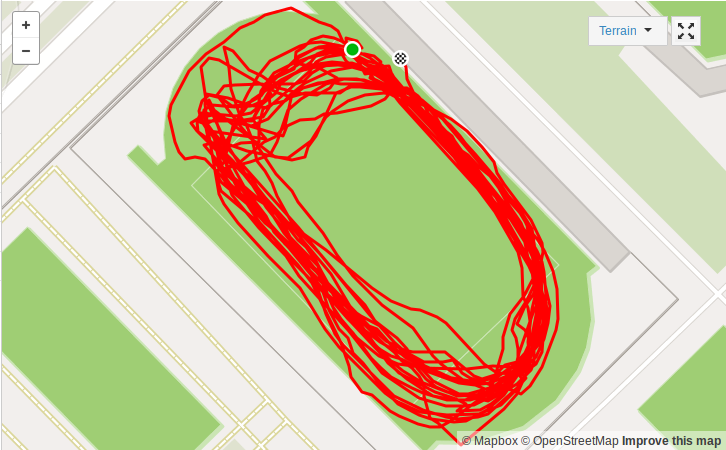 Here’s what a typical race track at the stadium (on Strava example, the MSU stadium). It can be seen that the track is basically goes just on the football field, rather than on the tracks. To explain this “just cut the track when cornering” clearly can not, anf I do not intend to find any explanations, because the errors are so grater then any football gates, that their correction is not possible and one can only be cry. The obvious result of the test: none of tested GPS-tracker can be used in training at the stadium. I do not set penalties for the test, because all of the applications surely did not pass it. Emulate the usual running on the road, probably, the main marathon training, which can be or pulled in, or recovering, or maintenance, or developing. In fact, it was riding a bike on an open urban space. The actual distance was recorded by adjusted bicycle odometer. The distance was 11.4 km. All applications (except Endomondo) slightly underestimated the distance, but a few percent – it is permissible accuracy for the given conditions. 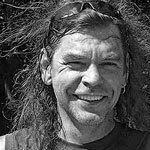 Generally, the error “down” better then error “up” when it comes to training, but if we are talking about competition, better not trust to GPS-navigation at all. Thus it appears that the all apps are suitable for the measurement of road training. I have not added a bonus for the test, as all applications – well done. 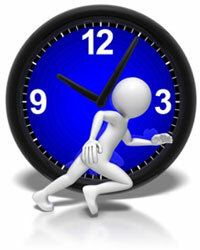 A special interval training: run rise on the steep mountain slope and calm run down, in circles several times. Why I included this exercise in GPS-testing? It is characterized by an extremely large difference in altitude, in ordinary life of runner does not occur, but specifically important for mountain running specialist, trails, sky rannings and other exotic species cross dealt with by supermen and superladies. It is very likely that for the cyclists it can also be interesting. 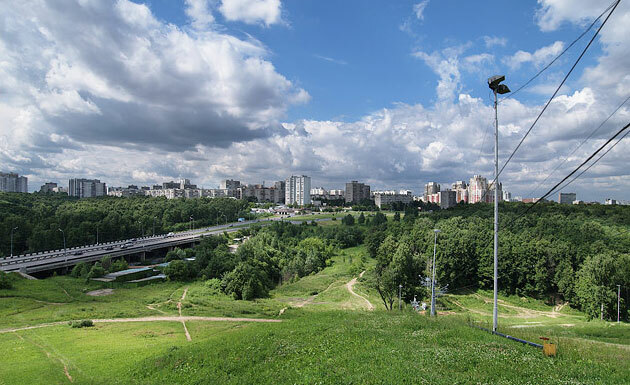 The route passes through the so-called “Sevastopol slope” along the lift exactly in the center of the image. A total is 10 climbs / descents. 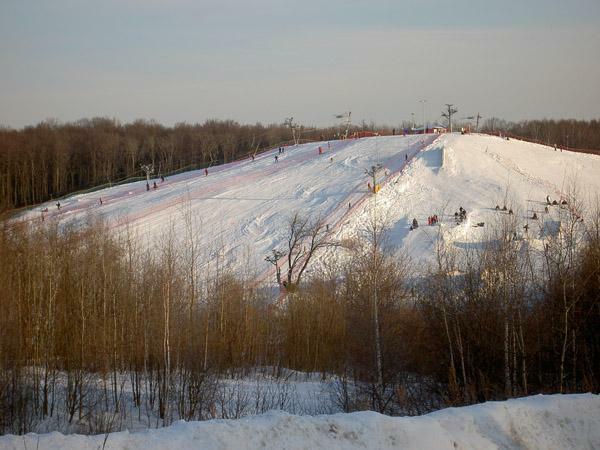 At site you can see that the length slope of 200 meters, elevation – 40 meters. Thus, the expected rise in total – 400 meters, or more precisely, 360, given a little lofty starting point. 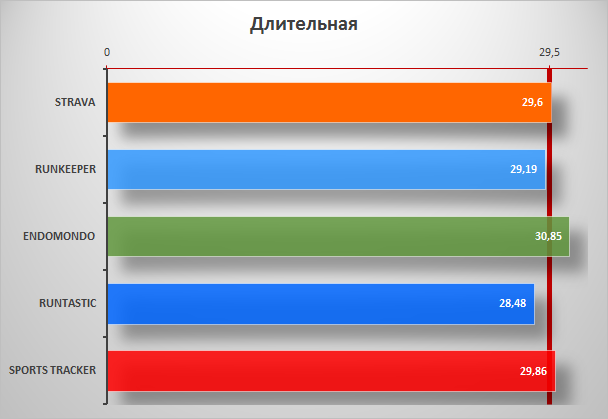 Nevertheless, I decided to check up the data by independent methods. Measure of attitude on the Google-map can be done at site of radio amateurs. 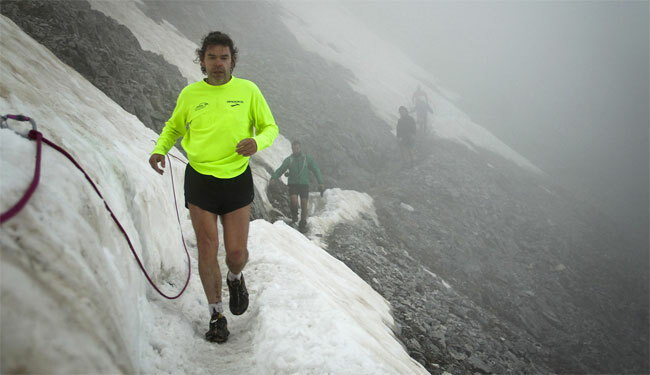 The attitude ofthe starting point – 202 m and attitude of the finish point – 220 meters. The total drop – 18 meters. Not 40. Not 36. Eighteen! 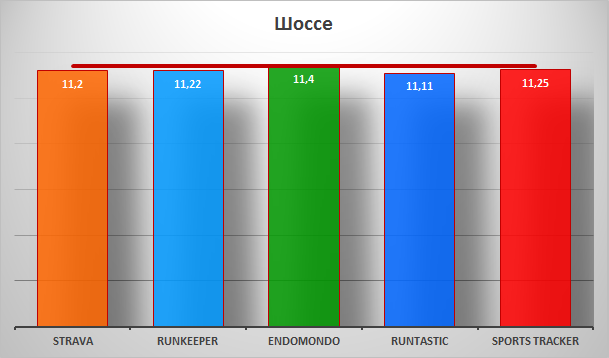 Two applications, Endomondo and Sports Tracker showed reasonable 350-400 meters, but three other applications (Strava, Runkeeper, Runtastic) showed climb 120-140 meters. Bah! Well yes it google’s data! That is our trio, Strava, Runkeeper, Runtastic, knowing that the GPS lying on the altitude, enjoys not actually measured data but requests for data from geo-coordinates of google server and brings them to the user on a blue eye. Little innocent fraud. I do not know how anyone, and I would not be dare to participate a mountain trail with such GPS-tracker. And for supermen would also not advised. Strava, Runkeeper и Runtastic are recognized as unfit for use in cases where a relevant measurement of heights or climb. In comparison Endomondo and Sports Tracker look quite successful. Long – the key type of marathon training, long run even with a low speed with the ultimate goal to master the lipid energy zone. Psychologically it is hard training, and many prefer to spend it outdoors, in parks and forests. It is therefore important, as the GPS-app responds to unreliable terminating signal in a closed sky. 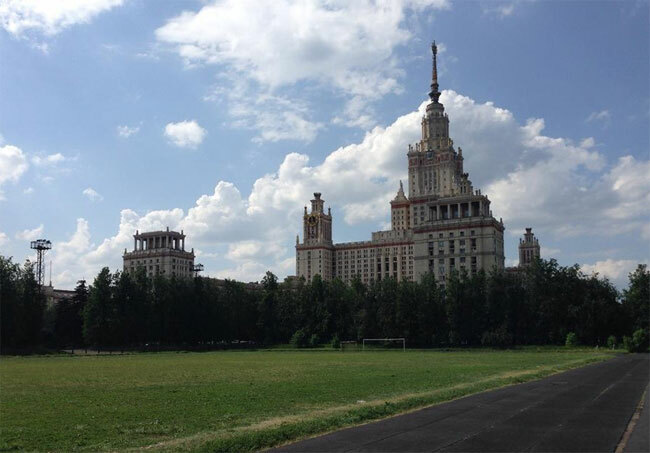 I have done the test at a distance of 30 km in Bitca park, measurements of it by bicycle odometer pre-calibrated at the stadium. Control measurements made 29.5 km, but keep in mind that even a calibrated odometer may be variations about of one percent depending on conditions. Stadium and the forest soil after rain – conditions are different. So I’m not intend to be very stricy to results. 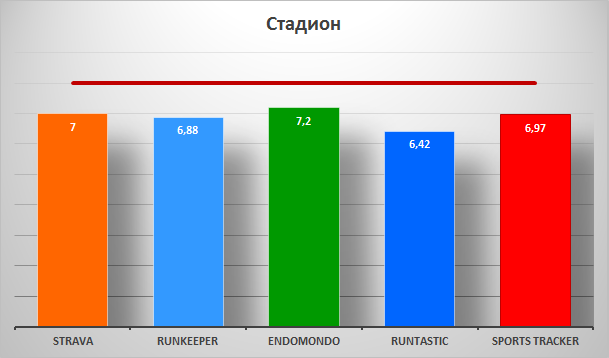 Runtastic slightly underestimated the distance, Endomondo slightly overestimated (which, of course, worse), but these errors are within the allowable look. 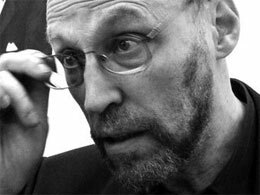 Of course, a series of tests would be safer, but such a test I can only be carried out once a week, and time is running out. And the emotional energy it oddly enough eat away. All tested applications successfully cope with the work on unstable poor GPS-signal in a closed heaven at lengthy training. 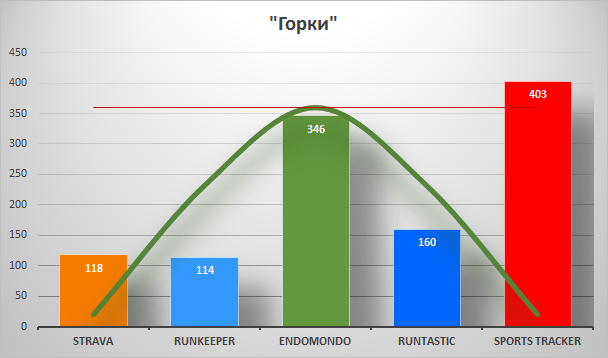 Conditional remark Endomondo, requiring repeated measurements. Such an outcome I was surprised and pleased. The result of testing sports of cross-country GPS-trackers for smartphones in a single table.